Editors' foreword. Preface. List of Contributors. Part I. General Virology. Chapter 1. Aids and the discovery of human herpesvirus type 6 [HHV-6] (S.Z. Salahuddin). 2. The epidemiology of HHV-6 (P.H. Levine, R. Jarrett and D.A. Clark). 3. Target cells for infection (P. Lusso). 4. In vitro propagation systems for HHV-6 (D.V. Ablashi and C.L. Hung). 5. Infection, latency and immortalization of human cells with HHV-6 (J. Luka). 6. Electron microscopy of HHV-6 (B. Kramarsky and Ch. Sander). 7. Biology and strain variants (D.V. Ablashi and S.Z. Salahuddin). 8. Molecular biology of HHV-6 (Z.N. Berneman and D.V. Ablashi). 9. Proteins of HHV-6 (N. Balachandran). 10. Interactions between HHV-6 and other viruses (P. Lusso, D.V. Ablashi and J. Luka). Part II. Clinical Pathology. 11. HHV-6 and exanthem subitum (H. Kikuta). 12. Exanthem subitum and HHV-6 infection (K. Yamanishi, T. Okuno, K. Takahashi, K. Balanchandra, K. Kondo, T. Kondo and T. Mukai). 13. HHV-6-induced mononucleosis-like illnesses (C.A. Horwitz, G.R.F. Krueger, T.A. Steeper and G. Bertram). 14. Kikuchi's disease [histiocytic necrotizing lymphadenitis] (M. Kikuchi, Y. Sumiyoshi and Y. Minamishima). 15. HHV-6 in atypical polyclonal lymphoproliferation [APL] and malignant lymphomas (G.R.F. Krueger, D.V. Ablashi, S.F. Josephs and N. Balanchandran). 16. Detection of HHV-6 genomes in lymphoproliferative diseases (K. Ellinger, F. Neipel, S. Seidl, B. Borisch-Chappuis, K. Müller-Hermelink and B. Fleckenstein). 17. Detection of HHV-6 using polymerase chain reaction amplification (R. Jarrett and M.E. Klotman). 18. `Post-Viral' chronic fatigue syndrome (A.L. Komaroff, G. Gupta and I.E. Salit). 19. HHV-6 and HIV-1 infection (M.H. Kaplan). 20. HIV-1 and HHV-6 infections of human retina and cornea (H.B. Qavi, M.T. Green and G.K. SeGall). 21. HHV-6 and bone marrow transplantation (D.R. Carrigan). 22. HHV-6 in Sjögren's syndrome (L.S. De Clerck, N. Bourgeois, G.R.F. Krueger and W.J. Stevens). 23. HHV-6: response to antiviral agents (M.V. Williams). Subject index. A full list of contents is obtainable from the Publisher on request. This publication on HHV-6 is the first and so far only one where a composite picture of the virus is presented. Comprehensive accounts of HHV-6 biology, molecular virology, epidemiology and their association with diseases, including the effects of antiviral drugs, are covered in chapters contributed by leading researchers on HHV-6. 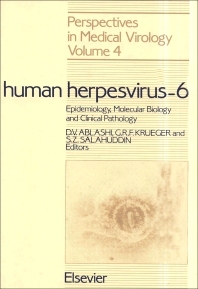 The book is an excellent source of reference on HHV-6 for basic researchers, diagnostic virologists, clinicians, medical students and medical librarians since it provides the most current state-of-the-art information on HHV-6.